Fall has arrived and with it came a slew of delicious, seasonal fruits and vegetables to enjoy. One that should definitely not be missed is winter squash. Winter squash comes in a wide variety of colors, shapes and sizes, each with a unique flavor profile and texture. When selecting winter squash, opt for those that feel heavy for their size and have a hard, undamaged rind. Acorn Squash: Acorn shape, dark green skin with hints of orange or yellow and pale yellow-orange flesh. It has a sweet, nutty flavor. 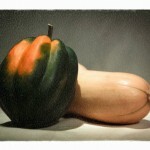 Butternut Squash: Pear shape with beige/tan skin and sweet, orange flesh. Spaghetti Squash: Long, oval shape with yellow skin and flesh. When cooked and removed from the skin with a fork, it forms spaghetti-like strands, making it a healthy alternative to pasta. Winter squash is an excellent source of vitamin C, packing half of our recommended daily dose in just one cup. It’s also an excellent source of vitamin A, getting its yellow-orange pigment from carotenoids, which include beta-carotene (may reduce risk of macular degeneration.) The darker orange the squash, the more carotenoids it contains. Both vitamin A and C are antioxidants, compounds which protect our cells from damage caused by free-radicals, reducing risk of cancer and heart disease. 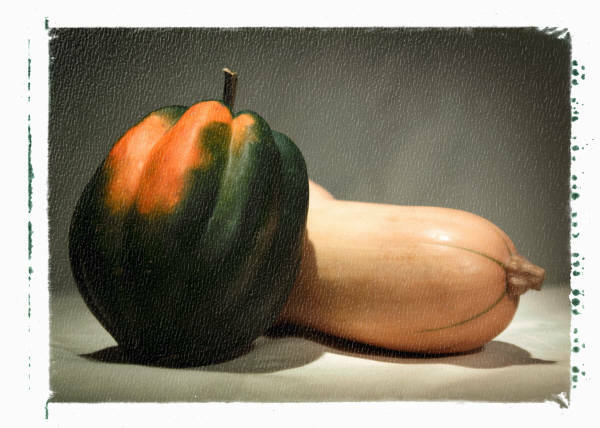 Winter squash is a good source of dietary fiber, containing approximately 6 grams per cup. Fiber not only keeps us feeling full for longer, but also improves gut motility, promotes blood sugar control, has a cholesterol lowering effect and protects us from various forms of cancer. Winter squash is not only packed with health promoting nutrients; it’s also easy to cook, delicious and very versatile. When preparing squash, steaming is one of the fastest and healthiest cooking method. All it takes is four simple steps: halve, de-seed, peel and cube. Squash can also be baked, broiled, roasted, sauteed, boiled or microwaved. When microwaving a whole squash, be sure to puncture the skin in several places with a fork or knife to prevent it from exploding. This is one of my favorite winter squash recipes. It is tasty, simple to prepare and freezes well. Serve it with a dollop of low fat, plain yogurt for protein and added flavor. 1. Peel squash with a vegetable peeler (from stem to root) and cut lengthwise with a heavy knife. Scoop out the seeds with a large spoon, cut lengthwise again and then into chunks. 2. Heat olive oil in a large pot. Add onion and garlic. 3. Once they have softened (~5 min), add ginger, squash, vegetable broth and cider. Cover and cook over a medium flame for approximately 20 minutes or until the squash is very soft. 4. Remove from heat, uncover and let cool. 5. Puree in a blender, food processor or with an immersion blender. Adjust the thickness with additional cider if desired.